Roma is a town, locality and the administrative centre in the Maranoa Region, Queensland, Australia. Kick off your visit on the 16th (Sun): pause for some serene contemplation at St Paul's Anglican Church Roma, then appreciate the extensive heritage of Roma War Memorial Heroes Avenue, then don't miss a visit to Roma's Biggest Bottle Tree, and finally don't miss a visit to The Big Rig. Plan my day in Roma using traveler tips and tourist information provided by Inspirock. Brisbane to Roma is an approximately 3.5-hour flight. You can also drive. Cap off your sightseeing on the 16th (Sun) early enough to travel to Tambo. Tambo is a town located in Central West Queensland, Australia, on the banks of the Barcoo River. On the 17th (Mon), view the masterpieces at Grassland Art Gallery, then take an in-depth tour of Tambo Heritage Precinct, and then look for gifts at Tambo Teddies Pty Ltd.
To find traveler tips, other places to visit, more things to do, and other tourist information, use the Tambo route builder . Getting from Roma to Tambo by car takes about 4.5 hours. Other options: fly. On the 17th (Mon), wrap the sightseeing up by early afternoon so you can travel to Longreach. Longreach is a town in Central West Queensland, Australia approximately 700km from the coast, west of Rockhampton. 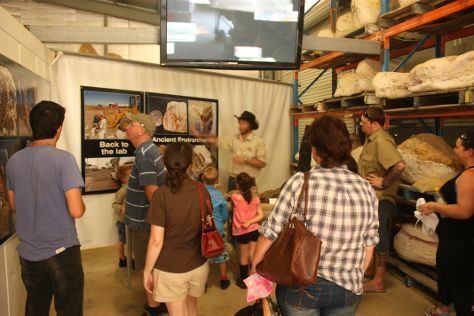 Kick off your visit on the 18th (Tue): see the interesting displays at QANTAS Founders Museum, then examine the collection at Australian Stockman's Hall of Fame and Outback Heritage Centre, and then steep yourself in history at Longreach. For other places to visit and tourist information, you can read our Longreach trip planner . You can drive from Tambo to Longreach in 3.5 hours. In June, daytime highs in Longreach are 28°C, while nighttime lows are 11°C. Cap off your sightseeing on the 19th (Wed) early enough to travel to Winton. Winton is a town and locality in the Shire of Winton in Central West Queensland, Australia. On the 19th (Wed), see the interesting displays at Australian Age of Dinosaurs, see the interesting displays at Waltzing Matilda Centre, and then see the interesting displays at Qantilda Museum. For other places to visit, reviews, traveler tips, and tourist information, use the Winton trip itinerary maker . You can drive from Longreach to Winton in 2 hours. Finish up your sightseeing early on the 20th (Thu) so you can travel to Camooweal. Camooweal is a small town and locality in the City of Mount Isa, Queensland, Australia. Kick off your visit on the 20th (Thu): take an in-depth tour of The Drovers Camp. To find traveler tips, where to stay, other places to visit, and more tourist information, refer to the Camooweal holiday planning app . You can drive from Winton to Camooweal in 7 hours. Alternatively, you can fly. You will leave for Tennant Creek on the 21st (Fri). Tennant Creek is a town located in the Northern Territory of Australia. To see where to stay, reviews, more things to do, and more tourist information, use the Tennant Creek trip planner. Drive from Camooweal to Tennant Creek in 6 hours. Alternatively, you can fly. In June, plan for daily highs up to 29°C, and evening lows to 15°C. On the 22nd (Sat), you'll travel to Alice Springs. You've now added Curtin Springs to your itinerary. Next up on the itinerary: get the lay of the land with Walking tours, identify plant and animal life at The Kangaroo Sanctuary, take in the awesome beauty at Mount Gillen, and see the interesting displays at Road Transport Hall of Fame. To find photos, where to stay, more things to do, and more tourist information, refer to the Alice Springs online travel planner . Traveling by car from Tennant Creek to Alice Springs takes 5.5 hours. Alternatively, you can fly. In June, Alice Springs is a bit cooler than Tennant Creek - with highs of 23°C and lows of 5°C. Wrap up your sightseeing by early afternoon on the 25th (Tue) to allow enough time to travel to Hermannsburg. Start off your visit on the 27th (Thu): admire the masterpieces at Hermannsburg Historic Precinct. On the next day, identify plant and animal life at Tnorala (Gosse Bluff) Conservation Reserve. To see traveler tips, ratings, and tourist information, read our Hermannsburg trip itinerary maker tool . Traveling by car from Alice Springs to Hermannsburg takes 1.5 hours. On the 29th (Sat), you'll travel to Kings Canyon. On the 29th (Sat), take an unforgettable tour with a helicopter tour and then explore the stunning scenery at Kings Canyon Walk. Here are some ideas for day two: hike along Watarrka National Park. To find maps, traveler tips, photos, and more tourist information, read our Kings Canyon trip planner . Traveling by car from Hermannsburg to Kings Canyon takes 7 hours. On the 1st (Mon), you're off toUluru-Kata Tjuta National Park. Uluru-Kata Tjuta National Park is known for nature, museums, outdoors, trails, and classes. Your plan includes some of its best attractions: explore the striking landscape at Uluru, stroll through Kuniya Walk, hike along Uluru Hiking Path, and explore the activities along Mutitjulu Waterhole. 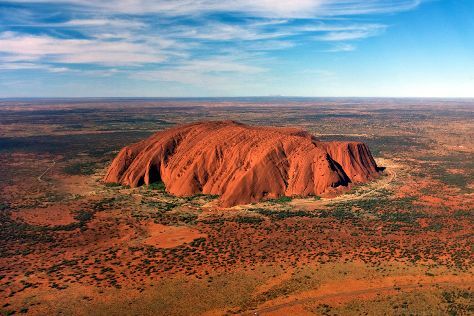 To see where to stay, maps, and tourist information, use the Uluru-Kata Tjuta National Park trip itinerary builder site . Drive from Kings Canyon to Uluru-Kata Tjuta National Park in 4 hours. July in Uluru-Kata Tjuta National Park sees daily highs of 24°C and lows of 4°C at night. Finish your sightseeing early on the 5th (Fri) to allow enough time to drive to Coober Pedy. 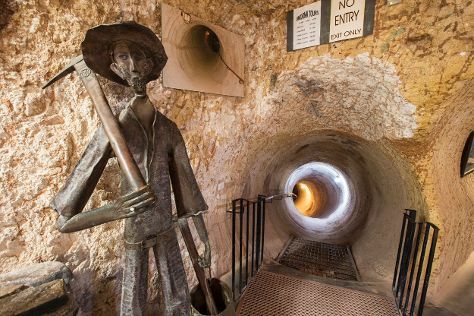 On the 5th (Fri), admire the striking features of Faye's Underground Home and then see the interesting displays at Umoona Opal Mine & Museum. For more things to do, photos, traveler tips, and other tourist information, read our Coober Pedy trip itinerary website . You can drive from Uluru-Kata Tjuta National Park to Coober Pedy in 8 hours. Alternatively, you can fly. Expect a daytime high around 21°C in July, and nighttime lows around 7°C. Finish up your sightseeing early on the 6th (Sat) so you can travel to Port Augusta. On the 6th (Sat), get great views at Water Tower Lookout, admire the natural beauty at Australian Arid Lands Botanic Garden, and then make a trip to Matthew Flinders Red Cliff Lookout. To find reviews, photos, maps, and tourist information, refer to the Port Augusta online tour itinerary planner . The Route module can help you plan travel from Coober Pedy to Port Augusta. July in Port Augusta sees daily highs of 19°C and lows of 5°C at night. Finish your sightseeing early on the 7th (Sun) so you can travel to Broken Hill. Start off your visit on the 7th (Sun): examine the collection at Mad Max Museum, then see the interesting displays at Silverton Gaol Museum, and then take some stellar pictures from Mundi Mundi Lookout. 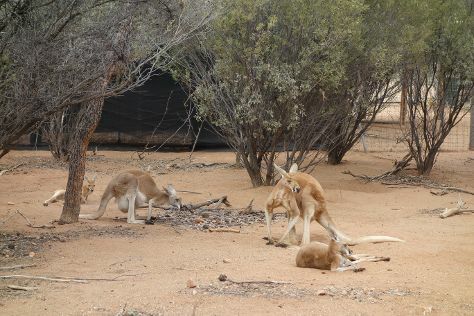 On the 8th (Mon), you'll have a packed day of sightseeing: admire the masterpieces at Pro Hart Gallery, identify plant and animal life at The Broken Hill Sculptures & Living Desert Sanctuary, then see the interesting displays at Royal Flying Doctor Service, The Bruce Langford Visitors Centre, and finally make a trip to Broken Hill Miner's Memorial. To find more things to do, maps, photos, and other tourist information, refer to the Broken Hill travel itinerary planner . Traveling by car from Port Augusta to Broken Hill takes 5 hours. Alternatively, you can fly. Traveling from Port Augusta in July, plan for a bit warmer nights in Broken Hill, with lows around 10°C. Finish up your sightseeing early on the 9th (Tue) so you can travel to Nyngan. Nyngan is a town in the centre of New South Wales, Australia, in the Bogan Shire local government area within the Orana Region of central New South Wales. To see traveler tips, maps, reviews, and more tourist information, use the Nyngan trip itinerary site . You can drive from Broken Hill to Nyngan in 6.5 hours. Finish your sightseeing early on the 10th (Wed) so you can travel to Goondiwindi. →←Goondiwindi is a town and a locality in the Goondiwindi Region, Queensland, Australia.. Kick off your visit on the 11th (Thu): admire the natural beauty at Goondiwindi Botanic Gardens of the Western Woodlands, then contemplate in the serene atmosphere at Holy Trinity Church, and then make a trip to Gunsynd The Goondiwindi Grey. To find photos, traveler tips, ratings, and more tourist information, you can read our Goondiwindi attractions planner . Traveling by car from Nyngan to Goondiwindi takes 6.5 hours. Finish your sightseeing early on the 11th (Thu) so you can travel back home.